Undated, Spectator archives. 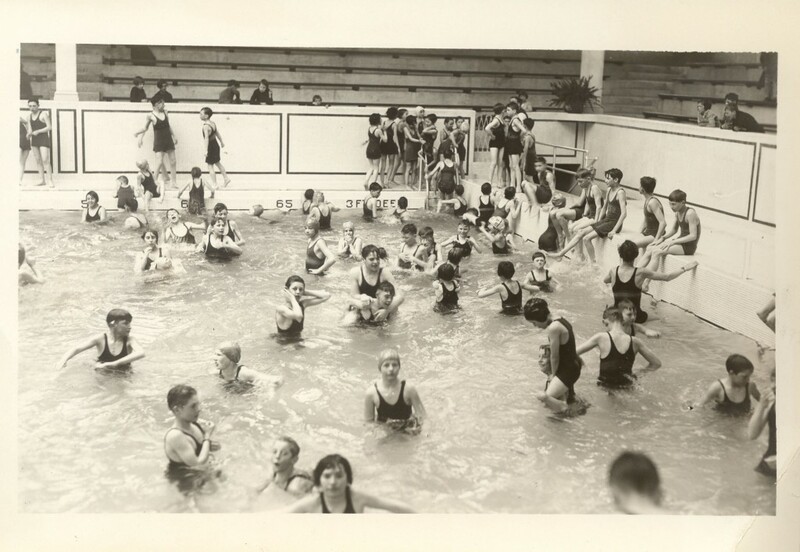 When the pool opened, adult admission was 25 cents, which included the rental of a towel and bathing suit. Generations of children have learned to swim there and tens of thousands have watched swim meets from the 1,200-seat viewing stands. The city says the pool needs to be torn down for a new recreation centre. But heritage advocates, including Jimmy Thompson’s family, say the pool should be preserved. Jimmy Thompson – known as “Mr. Swimming” – was hired as the city’s pool manager in 1932, and taught more than 60,000 children to swim. 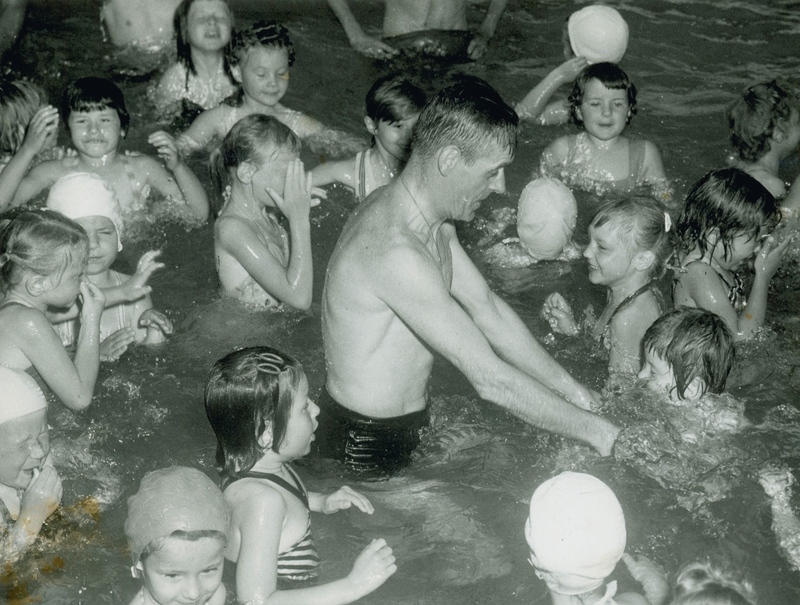 After Thompson’s death in 1966, the city renamed the King Street East pool in his honour.  Archived in Flashback and tagged Hamilton Ontario, Jimmy Thompson pool. Bookmark the permalink. There was no issue spending millions on renovating a stadium that is not used nearly as much as this facility. Why not keep this historic site and add on to make it a new, usable modern facility? Still, today, there is no better facility to host city swim meets and CANUSA games swimming……why are we even pondering destruction when it should be renovating/retrofitting that should be discussed? 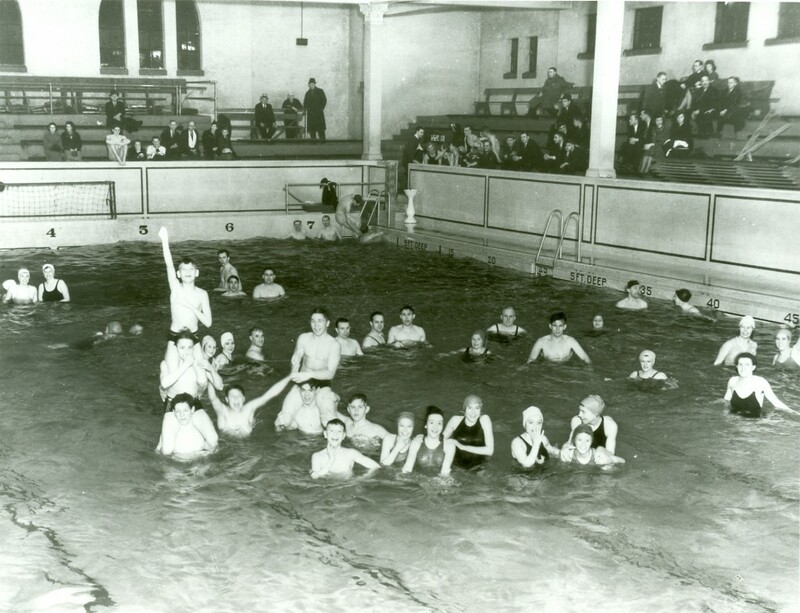 Until Hamilton can bring itself out of the dark ages of swim facilities (even new builds are inferior), this iconic facility needs to remain a historic landmark to a time when we recognized this sport as it should be–a sport for lifelong membership without discrimination, serving all people, all year round! This is where tax payer money best serves the community long-term. yes thank you at least you have some sense! why would the city tear down a pool with about 1,200 seats, and jimmy Thompson him self taught more than 60,000 kids to swim. I also go swimming with his son. Jimmy Thompson is still the best pool in the city to hold a swim meet. The new pools are not built for spectators and parents to enjoy watching their children swim. It needs to be made more accessible for sure. The city of Hamilton does not seem to be aware of what is needed in a pool. They wasted a lot of money building Westmount. We need an Olympic size pool. Our only 50 metre pool is at McMaster, and it is old and decrepit. There are no 25 metre pools in the Olympics! 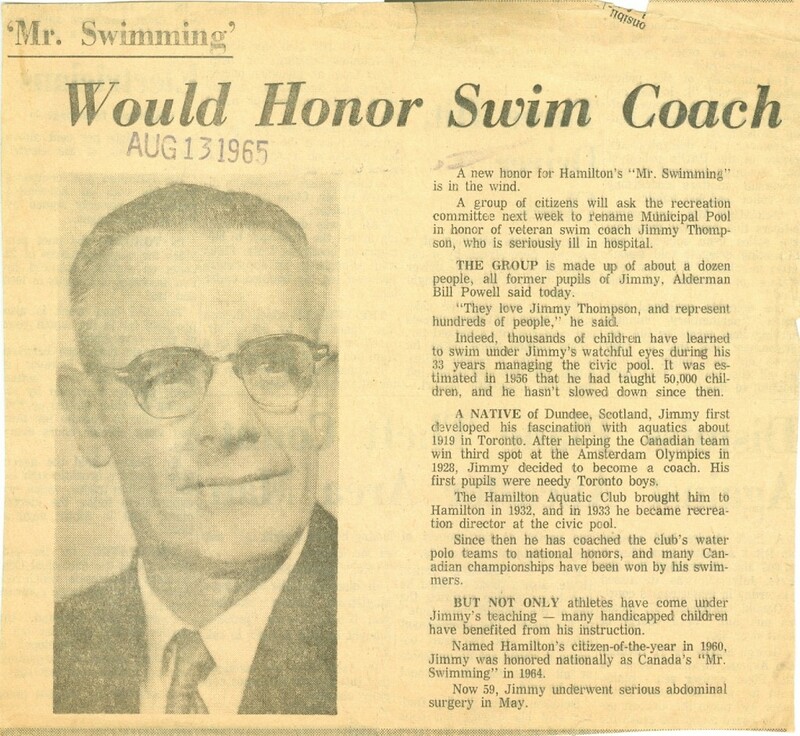 Jimmy Thompson and the pool named after him is and was the foundation of swimming in Hamilton, Canada and the International community. Some visionary thinking is needed here to maintain a sense of our history, and move forward into the future! 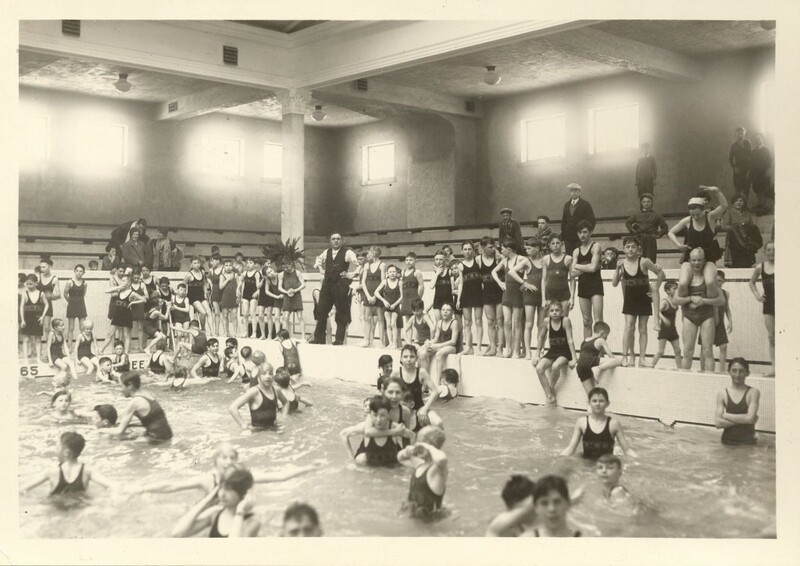 As a result of establishing Hamilton’s recreation swimming program, as well as the sport of swimming program and the Aquatic Club he founded, the nation of Canada had bragging rights to a many great and accomplished swimmers. One of the world’s best swimmers Joanne Malar developed in Jimmy Thompson. Without it, the foundation of an excellent swimming program that had developed, she may never have reached her potential. Excellence comes from the combination of opportunity, coaching, talent and hard work. Hamilton has had something to be really proud of. The City seems to be discontinuing this legacy of creating opportunity to develop excellence in the sport of swimming. It is also critical that the planning committee include organizations who are stakeholders in the development of swimming in Hamilton to be invited to the planning discussions. If the City wants to be considered for hosting International events, the decision on this issue will be critical. This facility has been a part of my family for the last 20 years and hopefully will be well into the future. My 3 girls all learned to swim here, as well as at South Central. My eldest is now a Life Guard and Swim Instructor, she started as a basket check girl. I’ve swam with them here and watched their polo matches here as well. I would be saddened to see this pool go and hopefully the city will see it’s ongoing value to the community. Many area buildings have changed recently, Prince of Wales P.S, Ivor Wynne, Scott Park H.S. (still here in a fashion), Scott Park Arena, some torn down and rebuilt, others sold/converted. Let’s hope that Jimmy’s fate is at least comparable with it’s neighbors and maybe with a bow to it’s honorable past. After Mr. Thompson passed, I travelled around the city with a petition in hand, obtaining signatures from many prominent people, and many who were taught to swim by Jimmy, and past and present members(at that time) of the Aquatic Club, to have the name of The Municipal Swimming Pool to Jimmy Thompson Pool, and presented it to The Hamilton City Council. Now, all is well; leave it be, as Jimmy Thompson would have it, would want it, as if he was still here. Don’t make this another “tree” incident!